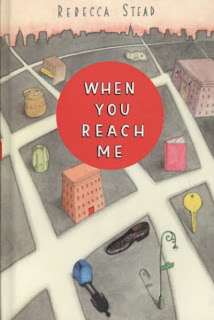 When You Reach Me follows a girl back in the day who loves Madeleine L'Engle's A Wrinkle in Time. The fact that the book is set in the past is not really noticeable, though. Grade school is a familiar setting for anyone who has attended. Someone is leaving cryptic notes for Miranda -- our sixth grade protagonist. She is also trying to figure out how to patch things up with her former best friend, Sal. The hint of mystery and slow build of suspense kept me reading until I got into the book; at which point I couldn't stop thinking about it. The book is pretty serious -- Miranda takes things seriously and is in some tough situations. Of course, that's not news for a Newbery winner. It seems like Newbery winners are often dealing with the most serious of subjects: death. Graveyard book, Higher Power of Lucky, Kira-Kira, just to name a few recent ones. But despite being a sober book, it has a fun twist of the fantastical. I won't spoil it for you. This would be a good book club pick, for sure. I simply had to talk to Jacob about it when I was done.